Adam generously gifted me an apple tv earlier this year. I was hooked at first click of that sleek remote. A Netflix subscription followed, and now apple tv and I are having a steamy affair. 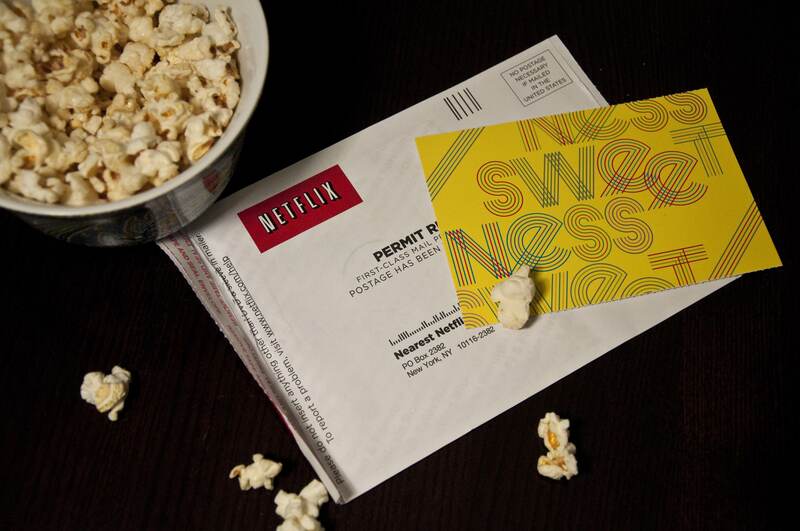 Netflix recommends movies I might like, remembers all my favorites and sends me mail—what’s not to love?! I got to thinking about the people who pack up the DVD’s and send all those rom coms my way. I’m an advocate of little surprises, so I tucked a postcard in with my The Royal Tennenbaums return. I wish I could see the face of the un-packer. A friendly hello to the somebody who makes movies happen for me! Thanks for packing (and unpacking) DVD’s so that I may pair my popcorn cravings and rainy days with a little cinematic sweetness! I hope this bit of yellow cheer brightened your day!